Continuing this week-long series of posts on cult crime writer Peter Rabe, I thought I'd cast a reasonably critical eye over the second in Rabe's loose series of novels starring one-time hood Daniel Port, partly because reviews of Rabe's books seem to be few and far between online, and partly because, well, I read it quite recently. Which is, I suppose, as good a reason as any. Daniel Port debuted in 1956's Dig My Grave Deep, which detailed his efforts to extricate himself from the clutches of a New York district racket, and ended with him heading off to start a new mob-free life. 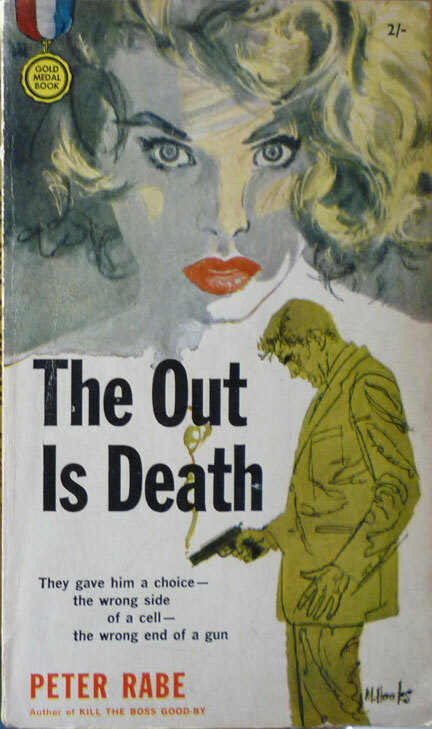 The Out is Death – published in the US in 1957 by Gold Medal, although the edition seen here is the 1959 UK Frederick Muller printing – doesn't so much pick up Port's story as drop him into someone else's, that of ailing heister Abe Dalton. Fresh out of jail, Dalton is being squeezed by gangster Dicky Corday into undertaking one more job. But Dalton is ill, and doesn't want to die in jail. Enter Dalton's old friend Port, who takes on the task of getting Dalton out from under Corday's boot heel. 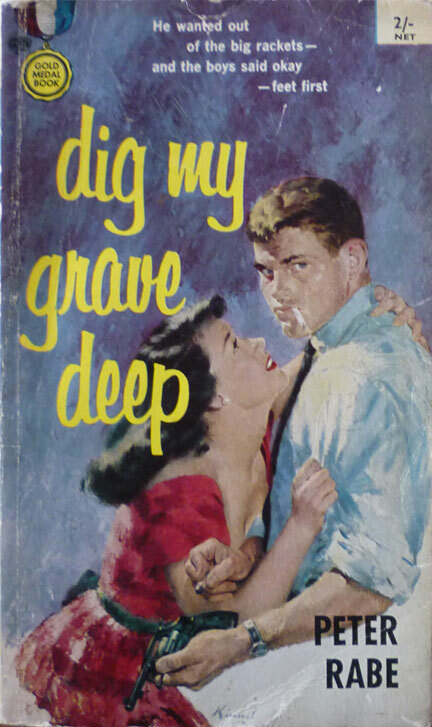 Whereas Dig My Grave Deep was all about Port's efforts to leave the criminal life behind, here he's trying to do the same for a friend, a quest that involves intermittent negotiation, bursts of brutality and eventually blackmail. Port is a pragmatist, reluctant to resort to violence but willing to do so to further his aims. He's also an operator who can still call on contacts and favours in his efforts to aid Dalton. But how much more there is to Port beyond that is open to debate. Even after two books I'm still not sure I've got a handle on him. Rabe gives him a couple of quirks – a penchant for cold coffee; a tendency to whistle when nervous – both of which are holdovers from Dig My Grave Deep. But other than those and an abiding competence and confidence, he's an enigma. Mind you, that's no bad thing: Richard Stark managed to sustain an entire series despite revealing even less about his character, Parker. Another similarity with Stark, who clearly learned a trick or two from Rabe, is the way Port's co-stars are much more colourful than he: the doomed, weary Dalton; the leering, infantile Dicky; Dicky's unfortunate girlfriend, Letty, who has a fairly awful time of it in this book; and in particular one minor yet crucial character, a woman who could provide the alibi for Dalton that would negate Dicky's hold over him – if only it wouldn't destroy her marriage in the process. Her name is Eve Simmon, and her story, recounted to Port after he attempts to get her to help Dalton, is heartbreaking and very real. The four pages where she details her poverty-stricken, increasingly nightmarish upbringing and the brief role Dalton played in lifting her out of a horrendous situation are the emotional core of the novel. This is where Rabe excels: in his depiction of desperate people faced either with dreadful choices or no choice at all. And that, on reflection, offers a further clue as to Port's make-up: his appearance in the lives of these characters does not, for the most part, improve them in any way. He's no hero: he's just a fallible man who thinks he can do some good, but only ends up making things worse. In other words, and if you'll pardon the terrible pun, he's one Port you wouldn't turn to in a storm. I recently read the 1980s Black Lizard reprint. It made my Best Books of 2010. Unpredictable plot, great characters, fine writing. I'll be reading more Rabe. It is really good stuff. And judging by your Best Books, you and I had a fair bit of crossover in our reading last year!